It's difficult to get across what these are like in terms of improvement and as I've said before the highest compliment I can give is that they are just what I would hope for from the factory, which isn't surprising as Nitron make shocks for original fitment on some of the range. If anyone is seriously interested and sees me at a meet with the car then I would be happy to take you out for a drive. Yes I know the rest of the suspension need a facelift. Looks nice. Wish they'd make something like this for an S2. Where ca I buy these shocks from? Looks like an online shop on this link. Is that so? Yes that is the link to buy them. Let me know if you have any problems placing an order. Coincidence as I've been out in the car today and decided to back off two clicks all round and feels better still. A friend was with me and he commented how good it was in the slippery conditions first thing this morning and how much better traction I was getting previously. Was nice to get a second opinion backing up my feelings. Can someone please tell me if this kit carries an international or European approval ? Without it, it will be illegal to use in Denmark. For example, I have just passed the bi-annual inspection on my Corrado, and they wanted this approval specifically for that product on my type of car, which is KW kit, that carries a Tüv approval, which they accept in Denmark. But as I said, it have to be an approval marked for this product only, and only on this car, with numbers stamped on each damper and spring. So, I gave them a copy of the one I had in the kit when I bought it, and will recieve a new registration paper shortly. So, before I will look further into this kit, I need to know this. This is starting to pique my interest, albeit I can't yet afford to buy them. Are the kits available with the correct S4s spring rate? I hope the Nitron boys know what the rates should be in that case, cos I've no idea what they are, apart from they might be harder at the back than the front. Or is that the other way round.....? Having replaced almost everything apart from the springs and dampers on the front suspension on my SE, I'd have loved to fitted a set of these . Do they even fit an SE, the ad doesn't say? I'm still rocking the cheap Protech shocks from SJ. I've forgotten what they are like to be honest it's been that long. These Nitrons are quite expensive though, perhaps with next years budget! Hi Bibs from order to delivery whats the time frame ? I'll check with the factory tomorrow mate but I believe it's under a week. I've fitted these to my car and they're a good balance - not too hard and not too soft with good control so I'm very pleased with them. I had bought another set up from another supplier using gaz shocks - advertised as fast road with sport 350 springs and damping rates but they were simply too hard so if anyone is looking for a track orientated set up give me a shout as these are gathering dust and of no use to me so will be cheap (they now lack the adapters for the rear chassis cups as I had to use them on the Nitrons - see below..) The nitrons are a good balance. However the rears didn't fit as supplied - well not to my 1990 SE at any rate. the steel cup on the chassis is at a diameter that the springs will neither go inside it or outside it. The locating rings on the original rubber cups on my car are too big in diameter to accept these springs (the rubber ring which should sit inside the spring is about the same size as the spring so it neither goes inside it or outside it). You need an adapter to locate on the chassis one way and onto the spring at the other...Ring nitron before you buy as you need a top rear mount fitting that will actually fit your car. There was a plate sent in their kit which didn't fit my car - it looked like it would sit in the bottom of the chassis cup but it was too big to go inside the SE chassis cup. Maybe the V8 they've developed this kit on has a different chassis mount with a wider diameter - anyway, speak to Nitron. I had an adapter from the earlier upgrade (?????) I'd tried before which fortuitously I could recycle. I also had an minor issue with the adjusters not working on one shock (rear drivers side) but on removal, the assembly was not screwed together fully so that presumably the adjuster mechanism wasn't engaging properly. Make sure that the various lengths are tightly screwed together (strange comment but will make sense when you see them) and that they don't loosen as you hold the central spline as you tighten the top mounts (access to the top mounts is tricky but that will be true for any kind of shock and is an Esprit issue rather than a Nitron issue) Once tightened down, all good. Finally, on the rears, the adjuster sits under the heatshield by the exhaust on the left hand side which is very difficult to adjust - impossible if the car is hot. It would be better if the adjusters were at the bottom, not on the tops - but at least they're out of the worst of the road dirt. So in summary, they're probably the best option out there (in my view anyway) and they work well but they need to fit your car at this price so you need chassis adapters for the rear if your car is like mine. Rears fitting easy and obvious if a bit fiddly. Make sure the bottom is the right way around and doesn't foul the mount. Fronts - loosen ARB so you can force the shock down and out of the car. I followed the pictures on the LEW website which I found to be extremely useful. I've not done tjis job on any car before but tis was simple enough. I took the top cup out of the chassis (the 3 nuts on the top leaving the spring compressed to take apart on the bench) rather than taking the top nut off and releasing the spring. Not sure i'd fancy that on a compressed spring on a standard set up without spring compressors as I like my fingers but mine already had coil overs on so I could release the spring tension by winding off the adjuster on the bench. Seems to be a lot of faffing around for an 'off-the-shelf' kit, to me. For the price I'd expect them to be perfect, and I wonder if it might be worth shielding the damper that is exposed to heat from the exhaust to save it from being cooked. 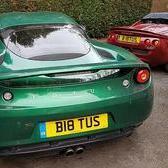 I did consider Nitrons a couple of years ago, and engaged in conversation with the chap at the Lotus Festival. The one thing I was concerned about was the spring rates, which as supplied are virtually double the standard for the front of an S4s and as the ride is already hard enough, I was wary of that. But I never got any further at the time, having been waylaid by more pressing issues. Trev Skedge kindly offered me a drive in his S350 at the time, which I took up, and they did seem to me to be an improvement on what I have fitted at the moment, though. More controlled, as I recall. Very usefull to know and I am about to buy a set for my 1990 SE. As the fitment seems to be not propperly made, and I live in another country, not being being able to pass by and have something here and there corrected, so for me, it is of Paramount importance, that it fits. Not nearly fits, but fits. I am not sure I understood the corrections you've made, though? What exactly do you need to buy and do? This though, will make me think twice, and contact Öhlins again to hear more about their solution. Especially as the Nitron set is not exactly a cheap set and they don't supply an EC, Danish or similar approval (I asked them), thereby making their set illegal in Denmark. @Jonathan evans I guessed that the Nitron 2.5" springs would not fit the Esprit SE without an adapter, which is why I asked in Trevsked's review of them. I had the same problem with my JRZ with 2.5" Eibach springs. The original kit was made with an upper spring cone, but that lead to all the load crushing the bushings. So I made my own 2.5" spring adapters for the chassis cups. You'll need an adapter similar to this, only in the rear of the car. Thanks for the explanation, Travis. Unfortunately, I am not in a position to neither design, nor fabricate such pieces. I really do think they should come with the whatever kit advertises to be made ready for that particular car. We'll see what happens during the Winter. Travis, it looks like you had to grind off the 'cup' from the chassis there, Jonathon did you have to do that, too? Or was it already missing on your car? The later S4s chassis rear spring mounts are different to the SE.. It appears to be a polyurethane rubber with a Shore hardness of about 55A.